We all know the standard advice to good dental health: brush after every meal and floss regularly. This is a well-known practice in general dentistry, and really does sound like a good approach to keeping teeth and gums healthy. Unfortunately, it can be a difficult thing to do and people are often looking at reasons to stop flossing. Is it necessary? Drawing a strand of floss between the teeth removes the small particles of food that brushing misses. That means a cleaner mouth, and less chance of enamel decay starting up in the small crevices between your teeth. Not only does flossing clear away bits of food, but also helps to scrape away the plaque that accumulates on everyone’s teeth. Of course, all of these points are perfectly reasonable and do make great health sense. Even so, there have been studies recently that have looked into the benefits of flossing and the results are somewhat mixed. The problem seems to be with how people are flossing, not with flossing itself. In other words, the average person doesn’t see much benefit from flossing because they’re just not doing a very good job of it. So when you hear news stories about flossing, you should make sure to get the details before you decide to ditch the habit because science says so. So the key to successful flossing is how you do it. If you are interested in getting a proper tutorial on the right way to do it, you should make an appointment with your dentist and have them show you. First of all, you should start with a long enough strand of floss (at least 18 inches, to allow yourself enough room to work). Wrap each end around your fingers securely, and work the middle portion of the strand up between two teeth. Don’t just run it up to your gums and be done. You need to shift position and run the floss down the side of one tooth, and then again to address tooth on the other side. It’s not really an in-and-out motion, but an up-and-down one. After one tooth, adjust your grip on the floss to move a clean section to the middle, and keep on going. 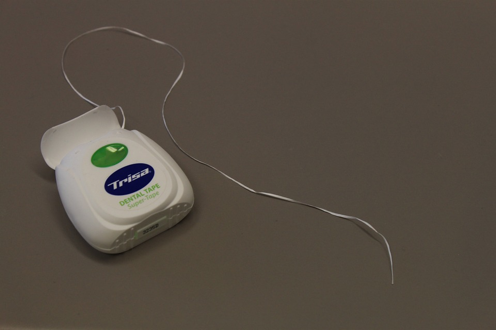 The best way to floss is with a simple strand of loose floss. Those little pre-strung plastic picks may seem easier but they are not a better choice. The tension in the strand is usually too tight compared to the give you get when you are using your fingers, and unless you switch out the picks between each tooth, you’re just moving plaque and bacteria from one tooth to the next. And water “flossing” devices will do very little good at all. They do a decent job at rinsing, but lack the force needed to really scrape anything off your teeth. So, don’t ditch the flossing habit just yet. If you’re not convinced that it’s doing you much good, try to improve your methods or ask the dentist for some tips on how to do it better.